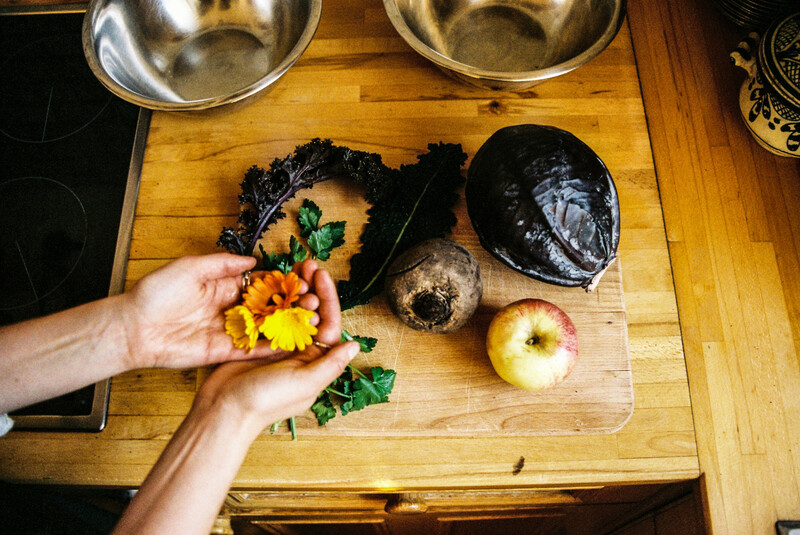 Cosseted behind the bustle of Edinburgh’s Royal Mile in an airy Old Town flat, atop a winding staircase we find Joy Rose, adamant cook, forager and mastermind behind a local salad delivery. A pot of fresh yarrow, peppermint and raspberry leaf tea brewing in the teapot, the light clear and bright over the sooty roofs of Edinburgh and the room peppered with mason jars full of herbs and horticultural almanacs – we find ourselves in the perfect environment to discuss the blossoming salad startup powered by Joy and her bicycle. 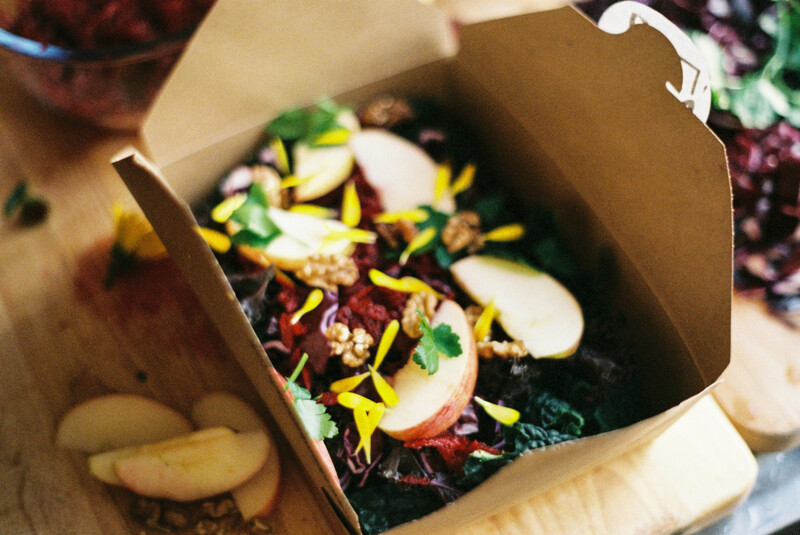 A relatively new business, Bloombox has been providing the inhabitants of Edinburgh with wholesome, organically grown salad, ethically sourced, designed and assembled by Joy herself and biked across the city’s undulating terrain in the wicker basket of her bike. In a little under a year, Joy has established a dedicated following of loyal customers and supporters clamoring for the next delicious bite of a much maligned meal. Brimming with enthusiasm about her venture and handing the tea cups to us with the confidence of a true tea leaf aficionado, our interview begins with the soothing balm of a cup of foraged tea. What makes a really great salad? First of all, the produce has to be of the highest quality and organically grown; the nutrients are maintained and it is more flavorful. So, having leafy greens as the base and then perhaps a grain through it. Then you need one or two toppings like grated beetroot or apple, the flowers add that extra bit of color and then a sprinkle of nuts followed by a really delicious dressing. The salads I make have so much going into them, that is what makes them unique. They are the kind of salads that would be a lot of effort to make for yourself on a daily basis. 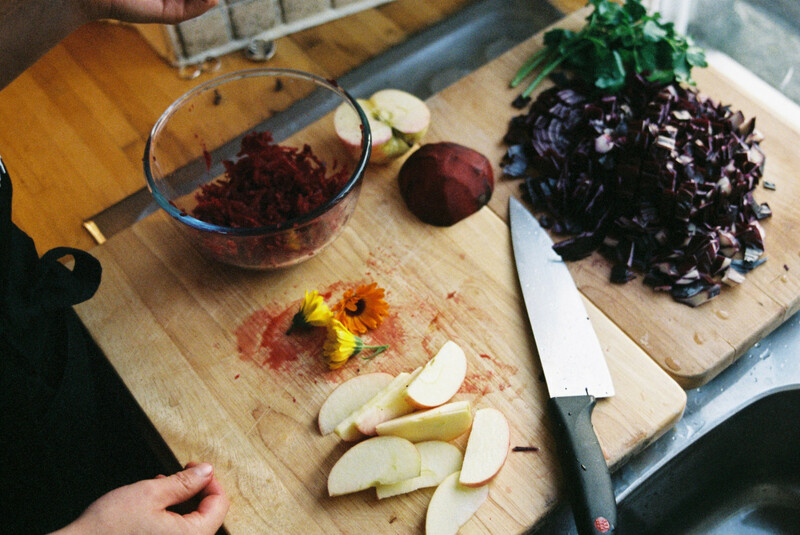 The main things are having those fresh good quality ingredients and then also a balanced nutrition and taste profile – using a combination of bitter, astringent, sour, salty and sweet tastes. 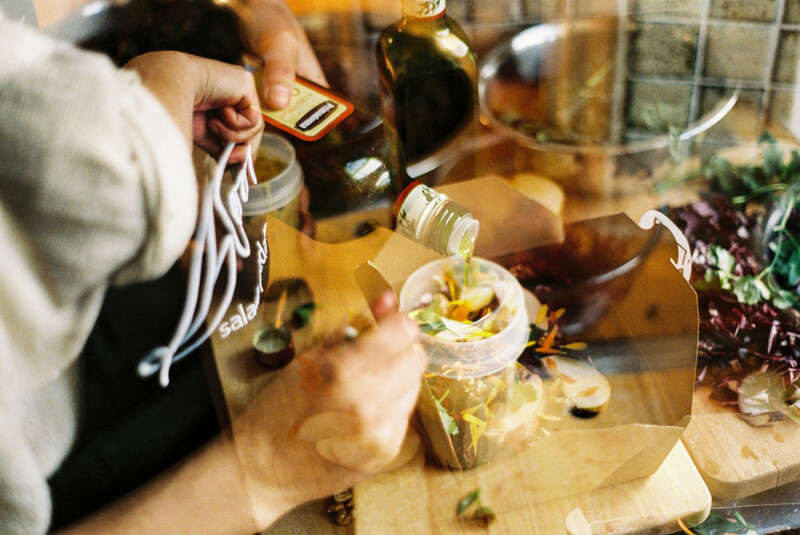 Is the aesthetic value of the salad an integral part of the process for you? Definitely – I’m quite bothered about that. The idea of using the flowers in the salads was to make it a colourful, enjoyable and fun experience. I wanted to add that extra element of curiosity for people too and encourage them to try something new that they wouldn’t maybe have experienced otherwise. There are so many colorful foods that are wholesome out there that I find inspiring to use in salads. I don’t think people necessarily perceive food having color as a positive thing and perhaps associate color with artificial foods. There are lots of great Scottish vegetables that are full of color naturally and are an important part of a healthy local diet. Do you try and give people flavors that you think they may not have come across before? That’s been something that over this season I have been exploring. As this is the first year, I have been reliant on local farmer’s produce rather than growing it myself. As a consequence, I haven’t known what kind of produce was going to be available when. Each week I’ve had to wait to find out what ingredients I’d be able to use. I would then build up the dressings and the accompaniments around it. It was always a bit of a challenge being on the go, and making it all fit together. How do you deal with that variation, it must be tricky but also creatively stimulating? I felt really challenged by it, but it did result in a few breakthrough moments where I would realize ‘this is it!’ Sometimes I would use a lot of books and recipes I’ve built up over the years and sometimes I tried completely new ideas, but it was a creative process responding to the challenge and making it all fit together. So it’s about engaging people with the process that actually produces their food? Yes, food systems are not a part of the school curriculum and they are not really that easy to discover because the supermarkets are so clinical and often don’t give anything away about where their food is actually coming from, it just looks like it’s coming from the back room. I think it’s a really important thing that people have lost. Can you tell us a bit about ‘The Secret Herb Garden’ and how you became associated with it? It was through the New Farmers program which is an educational course run by Nourish Scotland. It aims to bring on the next generation of sustainable farmers. Everyone got to choose a placement, so I chose to come here and it was such a fortuitous decision for me because using edible flowers in salads was something that I knew I wanted to do, but it was pretty much unheard of commercially, and then I came here and Hamish had been experimenting with the same idea. It’s great because it means that people can come here and try edible flowers and it starts to normalise the concept. Hamish is just so nice, and he was so generous to me as a volunteer. The relationship that I have with this place is such a positive, enriching one. What first got you interested in growing herbs and plants? Have you always been a keen gardener or is it something that has evolved more recently? Not always – my parents had a vegetable garden but I wasn’t always out there helping them, let’s put it that way. I would go and pick the lettuce for the salad but I wasn’t getting my hands in the dirt sowing seeds. It wasn’t actually until the last four years of university that I became interested. Well, first of all I started to care about where my food was coming from. My father had established a farm in Chile and as that became a part of my life, the process of actually putting plants into the soil did too. I began to realize that I really valued time spent sowing seeds that would eventually become the food you ate. To me, that became a really rewarding thing and I was inspired by it and I haven’t looked back since. Are you quite a patient person then? Or has this made you more so? In some ways. You have to get over failure pretty quickly, expecting to get it right the first time just won’t work. When I began to grow my own stuff, it was a bit of a mystery- I just had to wait and see what happened really. Even then, I would sow seeds that wouldn’t germinate and not be able to work out what I had done wrong, the best way is to try out different growing methods and note your observations. Your parents attitude to food and produce must have made you more aware of where food comes from than most children- do you think that had an effect on you? I think I probably was more in tune than I realized at the time. It wasn’t something that I thought was ‘the thing’ I wanted to do and I might have taken it for granted a little bit because my parents have always been into wholesome food and eating well so I grew up eating like that without fully appreciating it. You grew up in Manchester- was it in an urban environment or rural? It was basically right on the edge of the city; half of our house looked out onto the town and the other half looked onto rolling hills. That’s quite a neat analogy for what you are doing now. You sort of bridge the gap between the urban and the rural. That is really true, I’d never really thought about that. In some ways I think that at this stage in my life the idea of being too remote doesn’t appeal to me. Trying to make a difference around how we eat and what we eat is important to me and it seems like the city is the place to do that. I didn’t think, when I started this process that it would look like this, but this year has been about letting these things come at me and going with them. After a successful day’s foraging, Calendula flowers in hand we make our way back to Joy’s flat. With an array of delicious kales, herbs and grains lined up expectantly on the counter top, Joy treats us to a lesson in salad assembly, putting together a classic autumnal salad. 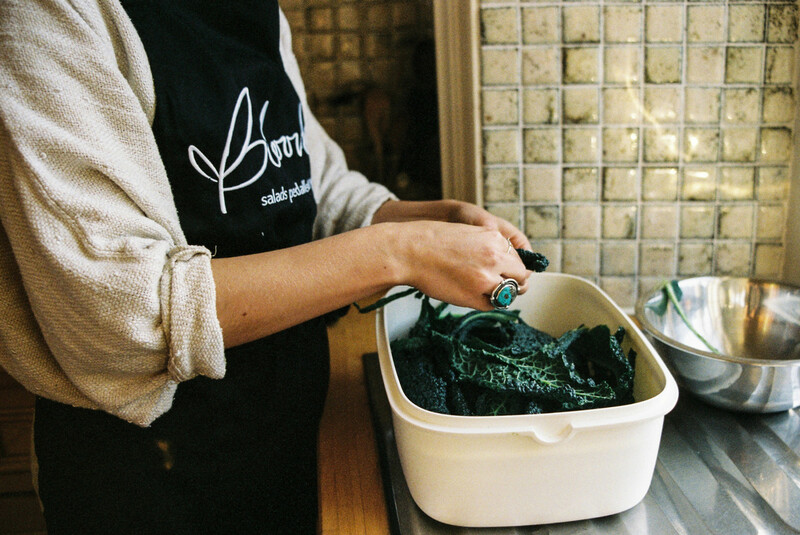 Joy washes two types of kale – cavolo nero and purple curly kale – and red cabbage quickly de-stemming them with practised ease. She then massages the leaves using a mixture of olive oil and salt which helps to break down the cell walls in the leaves making them more digestible. 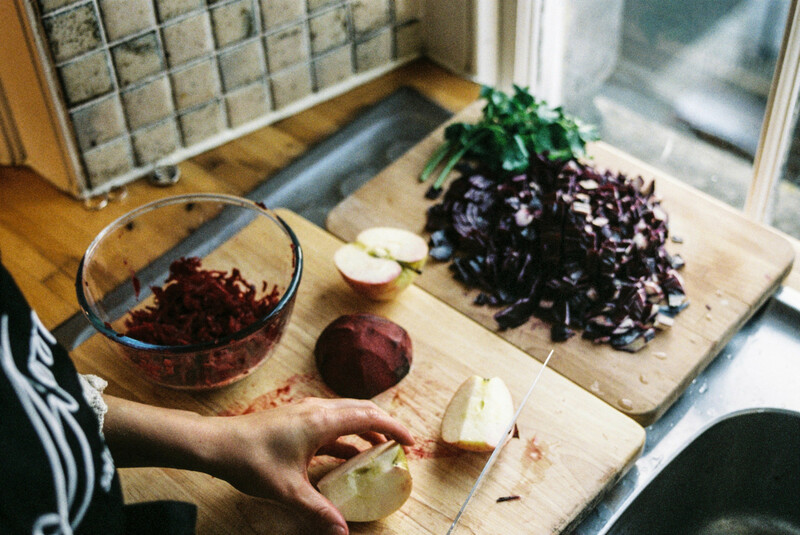 She then grates beetroot and layers it on top of the torn kale and the red cabbage leaves, tossing in some walnuts. Apples and parsley are added and then the secret salad dressing (a mixture of tahini, lemon, mustard, olive oil and honey) is drizzled on top. 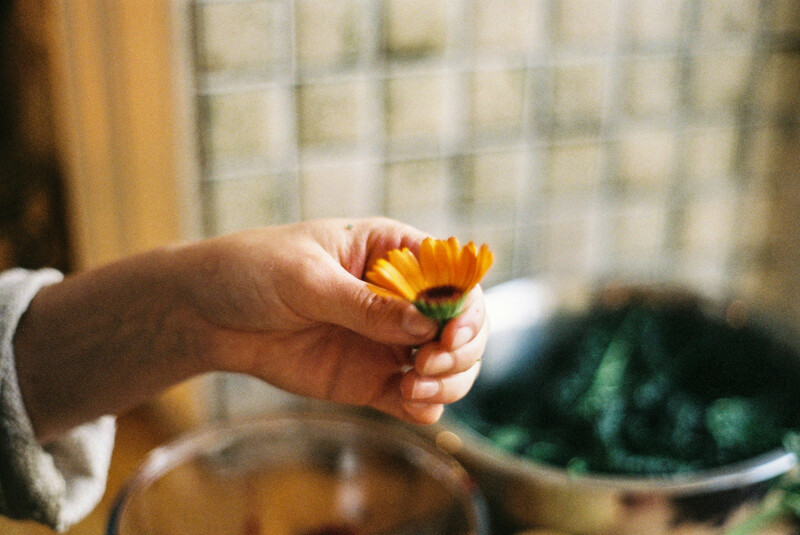 Finally she sprinkles on the golden Calendula petal and the salad is complete. Tell us about the genesis of Bloombox – how did you get to this stage? Just under a year ago I had had this idea which, cheekily, combines all my favorite things to do: the foraging side of things, cycling, making food and salads are all really close to my heart, and this idea combined all of those things. It started because I realized that in Edinburgh you simply can’t get a good salad, or I suppose what I envision as a salad, they are always just a bit uninspiring. It became clear that there was a gap in the market for a business that provided healthy, organic and interesting salads. I felt it was important to focus solely on one thing and do it really well and I wanted to have it mobile and environmentally conscious. I wanted to do something closer to the street-food industry and make it accessible to as many people as possible, so that was where the cycling aspect came in. I love to cycle and I also thought that delivering food to people and businesses would mean that more people would be able to try it. Some of my family are from California and so I spent a lot of time there growing up, and there are loads of healthy food delivery businesses there. It’s funny actually, I’d already had the idea a little under a year ago, and then I went there on a sabbatical in the spring. I was already quite far into the business planning at this stage but when I got there, it seemed like everyone was operating mobile healthy food delivery businesses – it was so crazy! At that point I just decided to really immerse myself in every facet of the industry while I had the opportunity. In a way it felt like a bit of confirmation that it was a good idea, and that there are people all over the world making it work. And none of those people appear to be in Scotland! Exactly! In America the ‘healthy’ food market is quite a commercialized bubble and I think it could be going in that direction here too so I wanted to do something a bit more down to earth than that. The words ‘healthy food’ get flung around all the time without really meaning anything – for me, it had to be a business that was honest, and maintained the integrity of its founding principles. How would you describe your venture’s philosophy? I think it is about keeping in tune with the seasons and connecting people with the land and where their food truly comes from – making the supply chain as short as possible and making wholesome, locally sourced organic food accessible to people and not an impossible idea. It’s not about me being the chef but more actually looking to what is available at that particular time and supporting those people who are making the effort to grow organic local food, respecting them and supporting that local side of the economy. Getting the food that is right on our doorstep to the people that actually live in this city and introducing foods into those people’s diets that have always been around but perhaps neglected. I want to bring people back to what Scottish food and the food around Edinburgh really is. Joy, thank you for spending the day with us and taking us foraging in this beautiful herb garden! This is our first time in Edinburgh and it will surely be followed by many more visits. Stay tuned as we’ll be sharing one of Joy’s salad recipes soon. 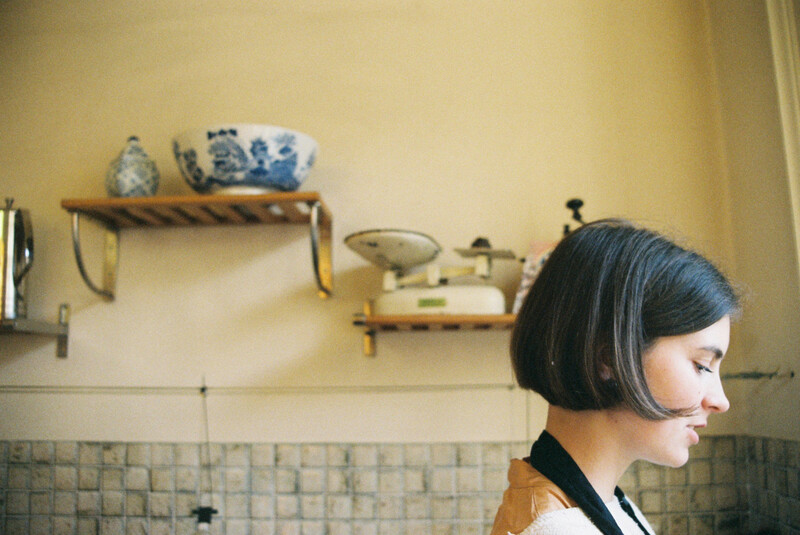 In the meantime, find colorful salads and other dishes on FvF Cooks and to meet all of the creatives we’ve portrayed, scroll through our Interviews section.